Edinburgh’s Hogmanay had a strong line up, showcasing some of Scotland’s fantastic acts including Paolo Nutini, Frightened Rabbit, Fatherson and Be Charlotte, as well as indie hereos The Charlatans. Feast took to the street party with the throngs and brought in the bells with an outstanding classic laden set from The Charlatans. First up on the Waverley stage was Dundonian band Be Charlotte. After firmly establishing herself in the consciousness of Scotland’s blogs and press with a serious of great sets at festivals up and down the country. Be Charlotte won over the crowd with her colourful stage attire and blend of innovative pop compositions,rapping in her dulcet tones, sweeping, impassioned vocal power and gritty beat-boxing loops. The band delivered a colourful and confident performance, and bigger stages are sure to beckon. This year certainly looks set to be a big one for Be Charlotte. Next up were new Scottish heroes Fatherson. Following on from their sold out show at the Barras, the band look elated to see the massive crowd snaking up Waverley bridge. Fatherson recieved a strong reception and the crowd’s appreciation was clear as the band led a soaring, rousing sing along. Vocalist Ross Leighton’s powerful yet gentle voice powered the band through their dynamic set. Given their impressive own brand of melodic anthems, and sold out shows, the Ayrshire band are hotly tipped to be Scotland’s breakthrough band of 2017. The Charlatans brought in 2017 with a career defining bells straddling set, mixing old and new throughout. From the unmisstakeable opening hammond organ of ‘Weirdo’, the Charlies delivered a celebratory set of sing alongs with ‘Blackened Blue Eyes’, ‘Tellin Stories’ and ‘How High’. 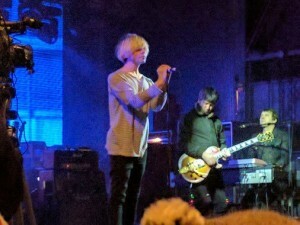 With 2016 promptly told where to go, waved off and with fireworks seemingly going off in every direction, The Charlatans launched into 2017 with glorious abandon as the indie anthems of ‘North Country Boy’, ‘You’re So Pretty’ and ‘The Only One I Know’ were unleashed onto the fever pitch party crowd. Whilst most bands at this stage in their career would be bored and tired of touring and playing the same songs over. The Charlatans and (never ageing) Tim Burgees in particular seem to be even more up for it, playing with renewed vigour. Perhaps the band are on extra shots of Tim Peak’s coffee or maybe it’s the realisation that they are a classic band, playing and releasing on their own terms now and that they have the arsenal of anthems to make a gig like this seem like a proper celebratory gig. Or maybe they just wanted to slam the door on 2016 like the rest of us and have a big party. Returning to the stage for a triumphant encore, and closing with ‘Sproston Green’ certainly proves that The Charlatans are still not only relevant but are full of exciting ideas for the future.